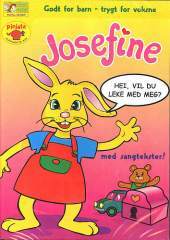 This is the first CD-ROM game of the series with the cute bunny Josefine. The game is filled with exciting activities perfect for younger children. In Josefine's room you can play with Josefine and all her things. For example, you can dress Josefine in her cool and funny clothes or play jigsaw puzzles in different grades of difficulty. You can take care of the fine horse of Josefine and be with her ​​singing cozy songs when she is out of riding.